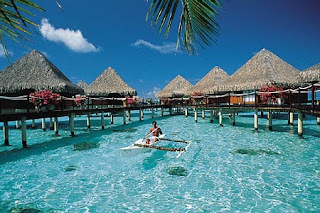 Earlier this month, I conducted several online searches for vacation deals to Tahiti, as it's one of mine and half the population's fantasy vacation destination. I visited lots of sites to gather information. For the next ten days, I was amused at the consistent volume of Tahiti display ads that "magically appeared" on almost any website I visited. I even saw the sparkling turquoise waters and straw bungalows of Moorea (Tahitian city) display ads on lawn fertilizer and screen enclosure sites. But this wasn't a clever coincidence. It's part of a highly sophisticated process that takes place in milliseconds over the Internet and serves as the heart and soul of Digital Rainmaking. Ad servers and digital ad networks use a variety of methods to serve online ads that are relevant and unique to each Internet user. Using browser tracking cookies, ad servers can display interest-based marketing content that is based on the types of pages you visited, the content you viewed or material you downloaded. But not to worry, Google says it will not associate served ad content with sensitive search interests based on race, religion, sexual orientation, health or sensitive financial categories. Everything else is fair game, so don't jointly surf the web with your significant other for anything immediately following that surprise Paris vacation search you conducted or else they'll start to wonder why images of the Eiffel Tower kept showing up on all those home remodeling sites you visited.